Beautiful architecture, excellent food and the breathtaking Caerphilly Castle make this South Wales borough an excellent staycation option. Around three-quarters of the area is countryside, meaning visitors can look forward to some delightful trails and beautiful scenery. 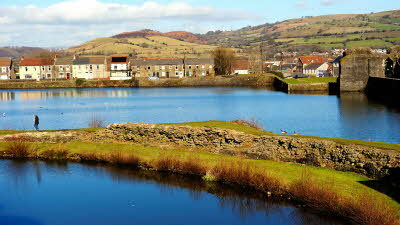 Don’t miss Caerphilly Mountain in particular; which offers majestic views 271 metres above sea level. Families with young children should not miss Futuristic. A soft play area with plenty for the kids to enjoy, it’s a great way to keep them occupied in between all the exploring. Last but not least, Caerphilly Castle is one of Wales’ standout attractions. Surrounded by moats and islands, it’s a fascinating glimpse into medieval times and a great place for relaxing and exploring.